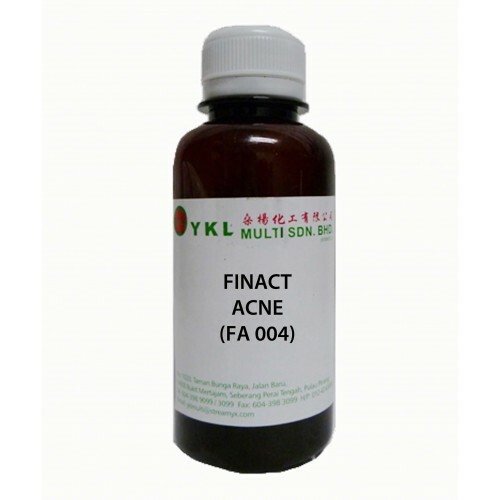 FINACT ACNE is a stable blend complex to treat acne. The anti-inflammatory properties help to sooth the permanent inflammation of skin with acne. It has a bactericidal activity against the germs responsible for acne. FINACT ACNE regulates the sebaceous secretions. It has a gentle cleansing effect on tissue and avoids the genesis of permanent scars. FINACT ACNE has no bovine origin derivatives. All the ingredients are of vegetable, marine or synthetic origin. It is supplied in limpid, brownish liquid. It is miscible with water and preferably introduced at the end pH the formulation with a pH remaining under 6.5.